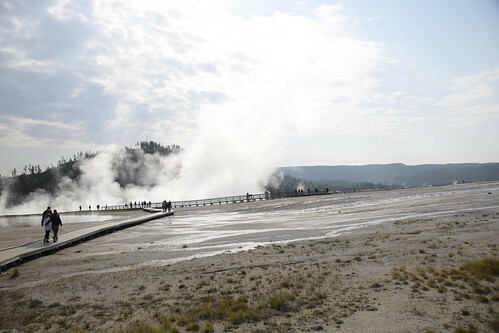 My last few posts have been about my recent trip to Yellowstone National Park to see my sister Ellen, the Park Ranger (so proud of her, our father was a Forest Ranger so it is great to see her carrying on the tradition). I only spent a few days with her as we went around the Park and the adjoining Grand Teton National Park, but I saw so much. 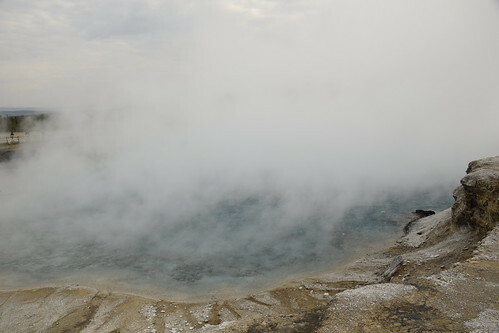 So one day we went to see the Grand Prismatic Spring at Midway Geyser Basin. I’ve seen lots of photos of it the last few years and maybe, or maybe not, I saw it as a kid during our whirlwind 1960’s style vacations that we took as kids. This trip I was wondering what the first people who saw the thermal features in the park thought. Steam and boiling hot water coming out of the ground. What a wonderland or what a nightmare. Plus the ground could give way any time sending somebody to their doom or at the very least severe burns. Something that happens to the dummies today who think the rules do not apply to them. 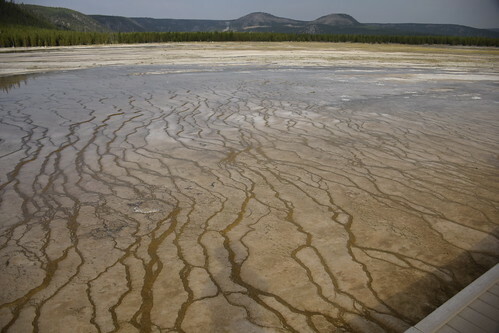 Yellowstone is a wonderland in many senses of the term. 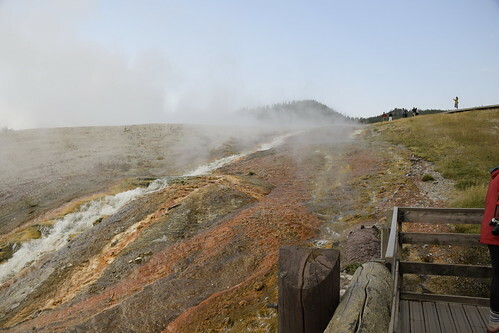 Its natural beauty is astounding and its supernatural features such as the geysers and hot springs are bewildering. 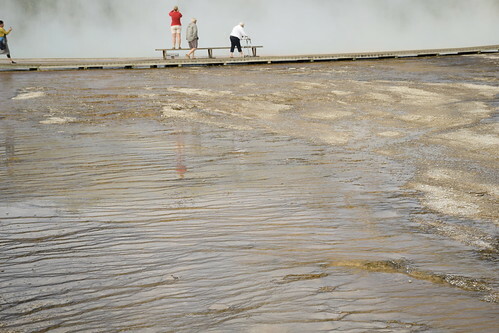 When you leave the parking lot of the Grand Prismatic Spring you come upon this scene of boiling hot water entering the aptly named Firehole River. The chemical engineer in me was doing mixing calculations trying to figure out how much the temperature of the hot water raised the river temperature plus wondering how much bad stuff from deep down in the earth is now dissolved in that how water, and how much precipitates out of solution when it mixes with the cold water, and how the remaining dissolved minerals and higher temperature affected the trout fishing. My sister just said she sees lots of fishermen (fisherwomen too!) on the River and so I decided I would worry about something else, especially since I didn’t bring my calculator with me. But it was like entering a different world with all the steam all around us. I learned that autofocus cameras don’t like swirling clouds of steam so I would focus a on a rock and then pan away. 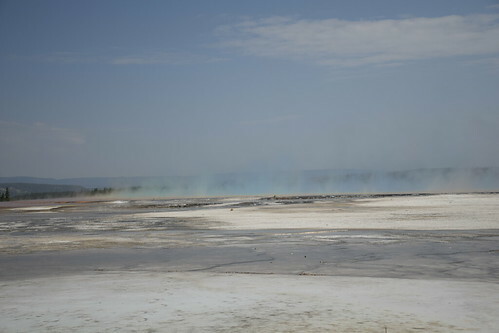 Just in case you are wondering why the steam is out of focus and the rocks are not. 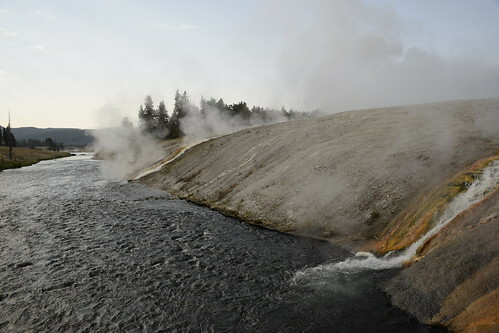 The closer you get to the Spring, the more steam you see, especially on a chilly morning. They have benches but they are mainly for people getting a better angle on the water. At first, I could see why you got up on the benches. So much steam swirling around obscuring the view. I liked this view. You can’t really see the spring, but you can see the colors of the spring reflecting off the steam. Ah here you go, things kind of cleared up a bit. 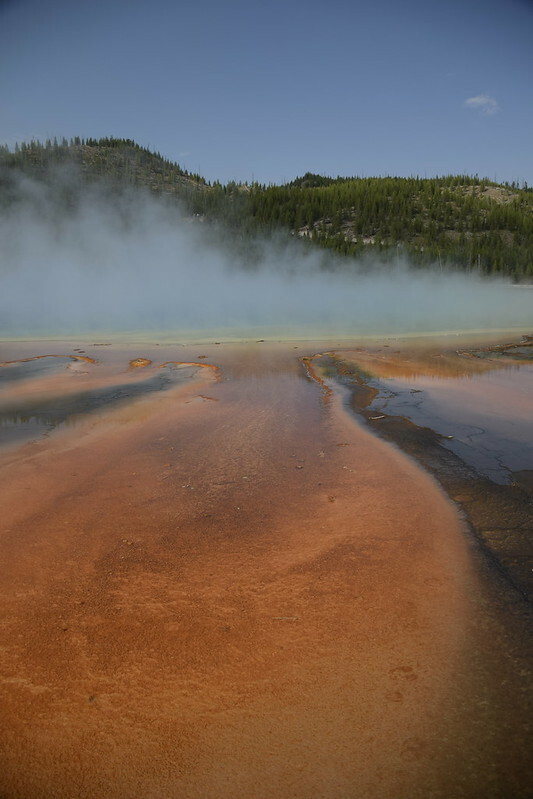 The different colors are from some of the bacteria that live in the spring that thrive at high temperatures. I find that concept fascinating. How can anything live close to boiling point with all sorts of strange chemicals involved. The strangeness just extends away from the spring. 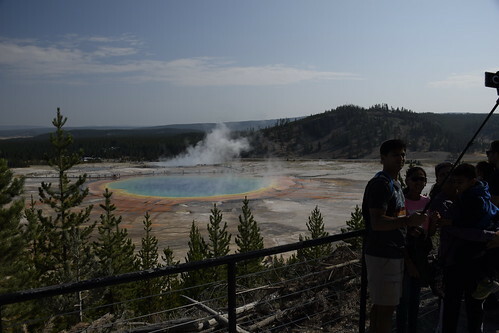 There is an overlook trail that Ellen took us to where you can get a better look of the Grand Prismatic Spring. You have some elevation and perspective that you don’t get at a lower level and it is easier to see. It is more than just a little walk but it is worth it if you are up to it. I think the spring is gorgeous. 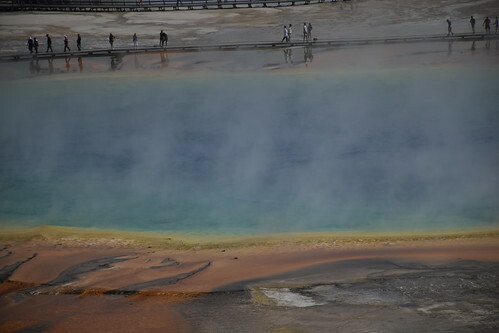 And I love the name Grand Prismatic Spring. I think it lives up to its name. 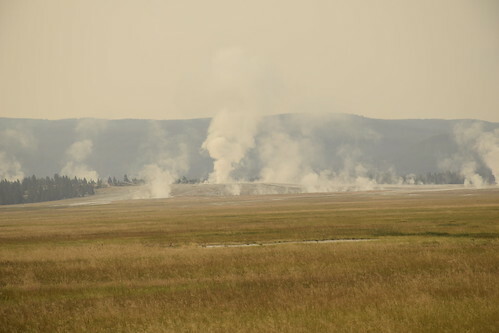 One thing about Yellowstone that I learned very quickly is that not just Americans love Yellowstone. The world loves Yellowstone Park. A huge percentage of visitors are from outside the USA. 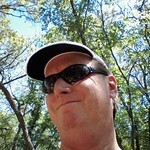 Somehow I feel that increases the responsibility of us to take care and preserve the park. The international visitors bring their culture with them and selfie sticks but somehow it all works and everybody gets along. I think that is great. This is a view at ground level below the overlook. We are pretty far away but one can still see the colors of the spring in the spring. I’m linking with Our World Tuesday, come check it out. 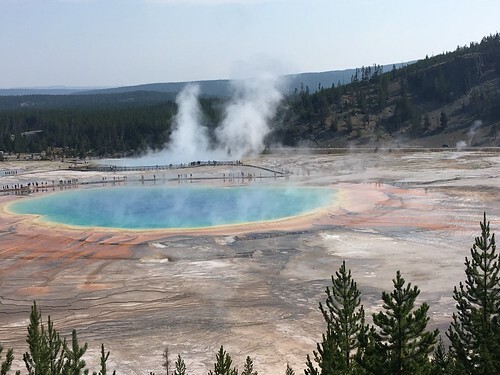 This entry was posted in Our World Tuesday and tagged Ellen, Hot Springs, Midway Geyser Basin, National Parks on August 26, 2018 by Alan Bates.